They sooo look like autumnal squashes!! A recent piece of research from New England Journal of Medicine compares the number of Nobel Laureates per a country’s capita to that of its chocolate consumption, no surprises they found that Switzerland has the highest number of Nobel Laureates and the highest chocolate consumption. Hmmm, but did ALL of these Nobel Laureates consume 50 cups of "xocoatl" (bitter water), a day like Montezuma or was it their Lindt equivalent in choc bars? This is in no way justification for that sneaky Family Size (insert your weakness here!) bar you just ate. 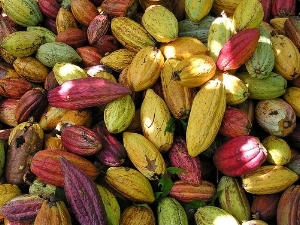 The fruit, called a cacao pod, is ovoid, 15–30 cm (5.9–12 in) long and 8–10 cm (3.1–3.9 in) wide, ripening yellow to orange, and weighs about 500 g (1.1 lb) when ripe. The pod contains 20 to 60 seeds, usually called "beans", embedded in a white pulp. The seeds are the main ingredient of chocolate, while the pulp is used in some countries to prepare a refreshing juice. Each seed contains a significant amount of fat (40–50%) as cocoa butter. Their most noted active constituent is theobromine, a compound similar to caffeine. Cacao was first probably discovered by monkeys – who actually only ate the fruity pulp and discarded the seeds, the sweet pulp of the cacao pod tasted like apricots or melons. The beans—or seeds—were bitter and seemingly inedible, the monkeys would eat the pulp and spit out the beans; no wonder there were plentiful cacao trees in South and Central America, this must have definitely assisted their evolution! It seems humans likewise only ate the pulp, until by some (lucky) happenstance the qualities of the cacao beans were discovered... perhaps some beans were thrown on a fire and the aromatic smoke produced a 'Eureka' moment!? Click here for a picture of a Pocket Monkey eating cacao ....awwwwwwww!! This ‘dark gold’ botanical was so highly prized by the Aztecs that they used it as a form of currency. The approximate exchange rate would be 1 cacoa bean = 1 tomato and 30 cacao beans = 1 small rabbit! 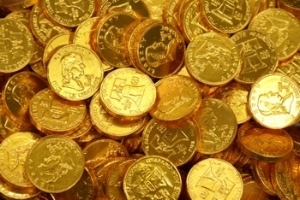 The bean also was still used as money in Central American markets long after the Aztecs were gone, as late as 1858. As you may know, the Aztecs and Mayans consumed chocolate in liquid form (the famed Montezuma and his 50 cups a day!). The beans were ground into a coarse paste and water added and would have been a spicy, bitter, thin tasting brew, unlike the creamy, sugary confection of today! It was served hot or cold, and frothy, as the foam was believed to hold chocolate's fundamental essence. The chocolate would be poured vertically from one vessel to another - perhaps the forerunners of (cocktail) mixologists - back and forth to make it froth and foam. The resulting paste would sometimes have spices, chilli and corn added for further flavouring to the liquid chocolate, the beans would also be mixed with corn and flavourings to make porridge-like meals - kind of puts your morning ready-brek/granola into perspective! In 1828 a Dutch chemist,Casparus Van Houten, (Johannes his son is mis-credited as having created this invention) patented a method of extracting the bitter tasting fat or "cocoa butter" from the roasted ground beans. The resulting cocoa 'cake' could then be pulverised into cocoa powder to give a more pleasant, smoother drink. Of course this then led to creating chocolate, by mixing it back in with cocoa fat and adding sugar and other flavourings, such as vanilla. The path was paved for chocolate bars as we know it! In 1847, the Fry's chocolate factory, located in Union Street, Bristol, England, moulded the first ever chocolate bar suitable for widespread consumption. Today, most of the world’s cacao beans are grown in Africa, ironically while much of the world’s coffee, an African crop, is grown in Latin America. Forastero – the most common and produces the most cocoa beans, it accounts for approx 95% of the global production. ; these are generally perceived to be of a poorer quality. The best cocoa beans come from the Criollo tree, a fragile tree with a small yield. Its fragrant, high quality beans are mainly grown in Latin America and are rated as producing the best flavour. Trinitario – is a hybrid between Criollo and Forastero beans. A robust tree with fairly good beans and a healthy yield. "Chocolate nourishes and preserves health entire, yet causes a pleasant and natural sleep and rest,"
"Drunk twice a day, a man may very well subsist therewith, not taking anything else at all." Even to this day, chocolate is a symbol of love, romance, comfort, luxury and a quick energy fix!